The more lives lost at sea, the shriller become the hypocritical cries of “stop the boats”. 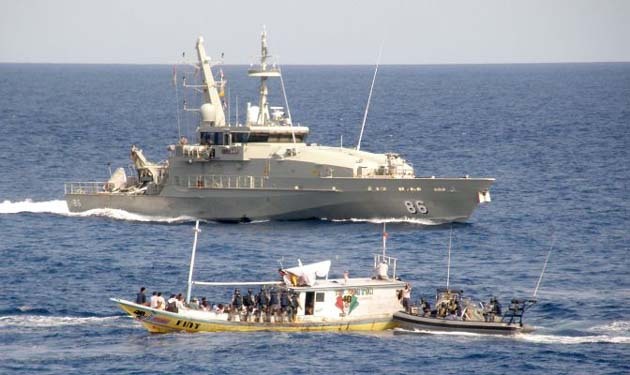 At the time of writing 6000 asylum seekers remain stranded in the Malacca straits while only hours away, the Australian navy ignores the crisis. This comes after the devastating drownings in the Mediterranean Sea, with two boats carrying 1100 asylum seekers capsizing in one week in April. Abbott grabbed for the political points: “I suppose we must grieve for the loss” he began, but, “The only way you can stop the death is in fact to stop the boats”. Opposition leader Bill Shorten has pushed the same “saving lives at sea” argument about offshore processing, although he tried to give it a more humanitarian gloss: “I will not live in an intellectually dishonest world where…we have policies which drag people here to hop on unsafe boats and drown at sea” he said at his Sydney University pre-budget address. Worrying Shorten has recently declined to answer questions about whether Labor will rule out boat turnbacks—a policy the shadow Immigration Minister Richard Marles has previously floated. But it is the goal of stopping boats that kills—and both sides of politics know it, because they have both been responsible for it. One of the most obvious but least mentioned ways to save lives at sea is to rescue people. But rescue operations are not a priority. Indonesia lacks the resources but the EU deliberately cut their operations. The result? 1750 asylum seekers have drowned this year. At the same time, Greece and Spain have constructed walls to keep people out, forcing them to take a longer, more dangerous, journey via the open ocean. There is a dark, hidden history of Australia’s border agencies letting boats sink. Around 1550 asylum seekers have died at sea, while headed for Australia, between 1998 – February 2014. So many lives were lost so close to safety. Some headlines tell the story: “Sank about 40 nm from Christmas Island—15 dead”; “Tow back—left 300m from Roti Island—3 dead”: and yet another “Crashed on rocks at Christmas Island—50 dead”. If anything demonstrates the calculated indifference of Australian Maritime Safety Authorities to the plight of refugees, it is the 2012 sinking of the Kaniva, SIEV 358. Asylum seekers on the Kaniva made no less than 16 calls to the Australian Rescue Co-ordination Centre (RCC). The RCC monitored the boat for a day, a night and into the next day, but provided no assistance. When the boat sank, 102 people drowned; 110 were saved, slowly, reluctantly. “Normal refugee patter”, “unnecessary alerts” and “forward motion under engine power” were some of phrases used to explain away the fact that 16 distress calls went unheeded, despite the boat being overloaded, and taking on water. Avoiding providing rescue assistance is partly motivated by Australia trying to make the Indonesian rescue service, BASARNAS, take responsibility, despite knowing it is severely under-resourced. As Tony Kevin, author of Reluctant Rescuers, explains: “We may assume that, had RCC Australia thought the distress calls justified, it would have launched an Australian search and rescue response. Instead, it was putting BASARNAS and other Indonesian authorities (navy, maritime police) through what amounted to a real-time training exercise. The results were lamentable.” Findings from the inquest included the basic recommendations that, if dealing with BASARNAS, instructions should be translated into the appropriate language and confirmed in Indonesian! But the Malacca Straits crisis demonstrates, horrifyingly, what happens if every government mirrors Australia’s approach. Tough border policies are not the determining factor in whether boats come. Push factors are far stronger—persecution and war in particular, and world-wide refugee numbers are once again on the rise. Nor is it true that the Coalition has “stopped the boats”. At least 16 have headed for Australia since the beginning of Operation Sovereign Borders. But the sickening truth is that when boats are prevented from leaving, or are turned back, this merely forces refugees to “die elsewhere”, at sea or in their country of origin. There has never been a more crucial time for the refugee movement to raise, and fight for, the slogans: “open the borders” and “welcome the boats”. Lives depend on it.